Raisin is a leading pan-european savings and investment marketplace that connects retail customers with banks that are looking to expand or diversify their deposit reach. Raisin provides to partner banks easy and scalable access to alternative funding pools at low and variable cost. 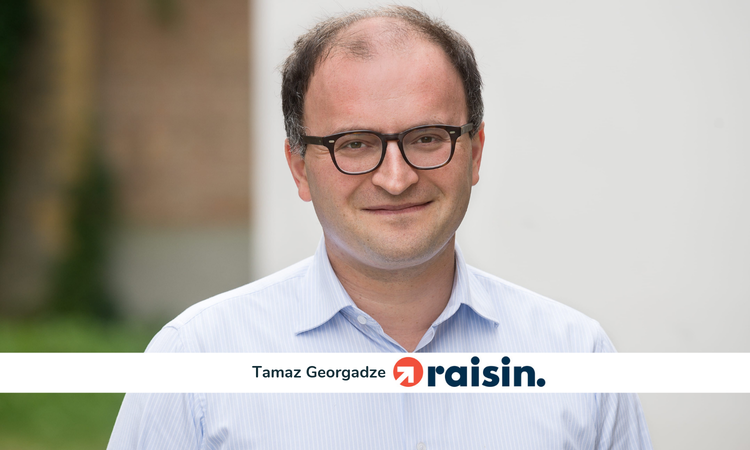 Fintastico recently had the pleasure of interviewing Tamaz Georgadze, CEO of Raisin. Tamaz has spent 10 years with McKinsey. He served some of the very largest retail, universal and wholesale banks throughout Europe and in Asia. He holds a PhD in agricultural economics, graduated with honors in law (both from University of Giessen) and international economics (from Tbilisi State University). 2013, you guys started. 2018, a trendsetter. 2019, acquisition of MHB Bank. What a ride. How did you experience all of this? As an exciting — if sometimes grueling ;) — ride, yes, but also an awesome journey. It’s good to see our work reflected in the results. We started off with a clear vision: we knew what problem we wanted to solve and we are doing exactly that. How will the Raisin and MHB business models be merged going forward? Both companies will remain independent enterprises. We’ve been partnering with MHB Bank for a long time. They’ve accompanied us as our service bank since our launch in 2013. They were our sparring partner for our business model before we even started. We have big plans for the future together: we want to shape and reinforce MHB Bank’s expertise in the credit fronting business for other fintechs. Here we see a real market niche. In the area of technology, infrastructure and expertise we will work much more closely together to build a state of the art ‘banking-as-a-service’ experience for fintechs like Raisin. This will allow us to offer better services and integrations to our partner banks and distribution partners. Will Raisin leverage on MHB to deliver its own deposits or other products? We do not indeed intend to offer our own deposit products. On the contrary, we are considering offering our partner banks to manage their entire deposit business for them through MHB Bank as a service. So the new services we’re looking at at the moment are facing our B2B partners. Is there a merge and restructuring plan to realign the two organizations and operating models? There is a development plan for MHB Bank itself, but not a plan to merge both companies. Of course we’re working together closely right now and will improve and shorten processes between both organizations. This way we can deliver solutions faster to our customers and partners. For us, customers always come first. Could you provide some high level figures about the short and medium term financial forecast of the merge? We’re always happy to share our results, but we keep our targets internal. How do you believe this evolution will impact how the marketplace is perceived by other players and the market? For other players and the market, this move marks a shift. It means that fintechs can now become banks and, more and more, enter traditional markets and fields. Digitalization is thus gaining a broader push and more competition – which, from my perspective, is very good since the whole ecosystem is still in the fledgling stage. From our partners’ perspective, our owning an experienced B2B bank — our now having a banking license, in effect — increases our credibility and capacity with respect to what we can offer other banks. To what extent will new technology such as Raisin’s change society? Consumers are now able to compare products and services without any barriers – in our case, barriers like borders, languages, costs, regulations, etc. to open a bank account in other European countries and start earning better interest rates. We’ve created a market access innovation with our pan-European saving portals and now we want to solidify our own infrastructure further so what customers experience becomes that much smoother and simpler. They gain more transparency and are more empowered to make better decisions. Today a customer is able to get all the information they need through the internet: costs, conditions and better terms. In general, technology companies and fintech in particular exist to open doors, to refocus the industry on customers’ needs and create fairer products. Customers experience this as greater convenience, trust and transparency: a huge win for society. Amazon, Paypal and Apple are entering the banking arena, offering different financial products and instruments. In your opinion, a threat? I see this development as a logical consequence and extension of their business model along the value chain. Their businesses are deeply connected with financial products and services. Why not expand, and offer their own customers tailored solutions? This will enhance both customer experience and loyalty. Given recent reports showing that consumers trust tech giants like Amazon around finance and banking, perhaps the banking industry will be positively challenged: it gives everyone a chance to learn and grow. Thank you for your time,Tamaz, it has been a great pleasure!